You may see cheaper firewood logs online, but we can’t guarantee that the quality is to the same standard as ours. Usually it’s been packed into pallet crates and shipped over from Eastern European countries, where the cost of labour is much, much lower – hence the price at the end. 1) You don’t know its origin, so there is a good chance it’s not sustainably sourced. 2) Increases risks of new diseases being introduced to British woodland. There has been lots of previous media coverage highlighting the risk, yet importing firewood continues. 3) Goods are unnecessarily transported thousands of miles by sea and road leaving a huge carbon footprint. All of the logs that we sell are 100% British, which means that we can keep a close eye on its origin and be sure that everyone involved in the process is paid fairly for their time and effort. Our logs have been sourced from British woodland using a process called thinning. Thinning is the selective removal of trees, to improve the growth rate or health of the remaining trees. Often the smaller, weaker trees are removed – making more light available for the larger trees to thrive. This process ifs usually undertaken every 5-10 years. This is tightly regulated by the Forestry Commission. The logs are then taken to a sawmill to be processed. Machinery used to cut the logs is powered by electricity supplemented by solar power. Once the logs are cut they are put into a ‘kiln’ to reduce moisture content. The kilns are powered using the dust left over from when the logs are cut. After the logs have been toasted in the kiln, they’re tested by quality control to make sure that they’re below 20% moisture -(as logs don’t burn as well they contain too much moisture). Once they’ve been tested and signed off, they are bagged up and ready to be delivered to any UK mainland address. Our kiln dried logs bags are mostly made up from British Oak and Beech wood – which packs a punch when it comes to heat, so you’ll be getting value for money. Most importantly, when buying our kiln dried logs, you know that some of the money is being reinvested back into looking after British woodland. How to spot imported wood? Logs are packed in pallet crates. The delivery packaging features no ‘brand’ or has been rebranded by a UK retailer but not referencing its origin. A lot of the pallet crate wood coming from Eastern Europe is made up from Alder or Birch wood – species. 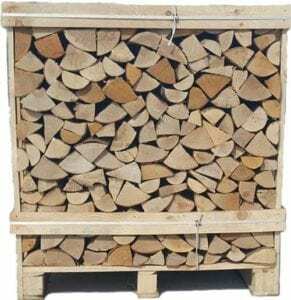 We also recommend you avoid unseasoned logs..
It’s important to choose seasoned kiln dried logs over unseasoned firewood, because it provides much better value for money. Unseasoned firewood has a high moisture content – which can be anywhere between 30 to 50% saturation. When unseasoned logs are burnt, they give out less heat – as more of the energy has to be use to get rid of the water in wood. So you’d end up needing to use more logs to get enough heat to keep you warm. Unseasoned logs also give off more emissions, smoke and atmosphere pollutants – which isn’t good for the environment at all. Give British Kiln Dried Logs a try and enjoy a more sustainable fire.